Yes with zeal, these days, people are brushing their teeth. The great strides made in cosmetic dentistry have made it possible to have teeth that look almost perfect and at a price that doesn’t cost so much that you qualify for a medical deduction. Toothpaste manufacturers have joined this revolution with their own contribution. What is Wrong with Brushing Harder? Brushing your teeth is good, but brushing more frequently or harder can lead to a problem for you. 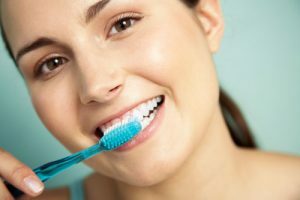 While you usually exchange your toothbrush for a new one after three months, your vigorous brushing may actually dictate that you replace your toothbrush more frequently. If you don’t want to replace your toothbrush more frequently then you must have a way to determine if you are brushing too vigorously. How Can You Tell if You’re Brushing Too Hard? To determine if you are brushing too hard you will have to brush your teeth where there is a mirror. While you are brushing, watch the bristles on your toothbrush. The bristles should stay straight because the objective is to gently rub the bacteria and debris from the surface of your teeth. If you are putting too much pressure on your toothbrush, and consequently your teeth, your toothbrush bristles will bend. If your toothbrush bristles bend, you are brushing too hard. If you are brushing hard to get your teeth cleaner or whiter faster, stop. Brushing harder doesn’t make your teeth cleaner. In fact, it can damage your teeth. As for getting your teeth whiter, that is a process that happens over time. The more diligent you are in brushing, flossing and avoiding substances like tea, coffee and tobacco products, your teeth will eventually get as white as they can. Please contact our office if you have any questions about brushing your teeth too hard.